KARBALA, Iraq — A high-ranking Shiite cleric delegation from Najaf visited the holy Yazidi temple in Lalish northern Iraq on March 17. Yazidis witnessed a horrible genocide by the Islamic State in Iraq and Syria. The visit is a part of a campaign carried out by Shiite clerics to gather religious leaders in different parts of Iraq in order to promote coexistence and tolerance. On March 7, high-level Christian, Muslim and Yazidi religious leaders met in the Imam Hussein Shrine in Karbala, southern Iraq. The shrine is one of the holiest places for Shiite Muslims. The participants toured the holy place to send a message to the people of Karbala and to the Iraqi people that they seek to join hands for peace and a shared coexistence between Iraqis of all religious denominations. Karbalai stressed the importance of the cross-religious joint action, and the need to translate these dialogues into a plan of action to be submitted to the Iraqi authorities. 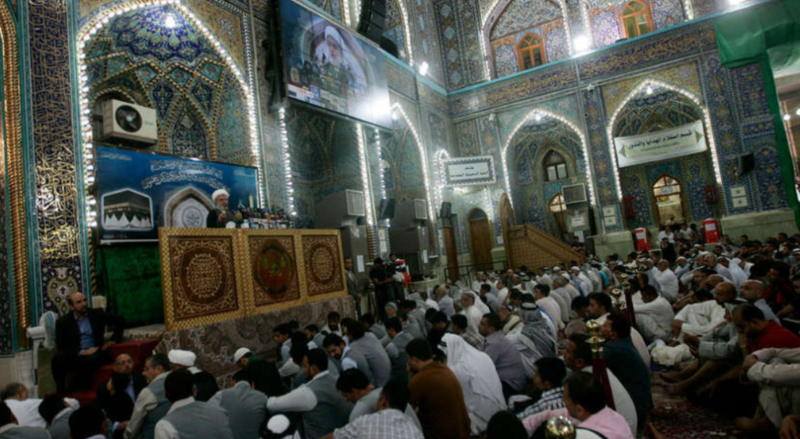 The convention of religious leaders was held under the slogan of “God loves to spread peace.” It was inaugurated by Talal al-Kamali, a member of the board of directors of the Imam Hussein Shrine, who welcomed the participants and expressed joy that a holy Shiite site had welcomed leaders from across the religious spectrum in Iraq. Kamali said several previous conventions had been held with many prominent religious figures, which is further proof of the seriousness of a joint action to promote peaceful coexistence under the current circumstances as Iraq has emerged from the crisis of the Islamic State (IS), which had previously taken over parts of the country. The high-level meeting touched on the main current issues of major importance for Iraqis. Most notably, participants discussed the Vatican announcement that conditions for a papal visit to Iraq are “not yet met” and also the trip Pope Francis took to the United Arab Emirates, and the subsequent historic declaration on “human fraternity” between Christians and Muslims. Also, Cardinal Mar Luis Rafael I Sacco, the Chaldean patriarch of Iraq, issued a “homeland declaration” to urge the three Iraqi presidencies to meet and resolve the outstanding problems between the political parties and movements in Iraq. This is in addition to the “Mandaean hope document” put forth by Mandaean groups outside Iraq, sounding the alarm on the reality that Mandaeans are on the verge of extinction in Iraq. The meeting also discussed the seriousness of what was termed Sunni and Shiite hate speech during Christmas celebrations, as many have called on Christians not to take part in Christmas festivities. The consequences of the reported slaughter of 50 Yazidi victims in Syria’s Baghouz at the hands of IS also were on the convention’s agenda. In the context of all this, the Chaldean patriarch stressed the need for a high-level pilgrimage visit to the historic city of Ur in southern Iraq, where the Prophet Abraham was born. The cardinal said that leaders of Abrahamic religions should go on this pilgrimage in an effort to show unity among Iraqis and to encourage the Holy See to visit this holy and highly symbolic place. On the sidelines of his discussion of the “Mandaean hope document,” Mandaean community leader Jabar Helou said these meetings help bridge the gap between the different religions in Iraq and help dissipate Mandaeans’ fear as to the possibility of their extinction in Iraq, in light of their thin demographic weight and the departure of nearly 90% of the community’s members from the country. He expressed hope that the outcomes of these conventions would encourage the remaining members of the Mandaean community to stay in Iraq, which he believes is the most challenging issue on the agenda of these high-level meetings. The director of Al-Khoei Institute in Najaf, Jawad al-Khoei, said the meetings yielded some practical results, including the decision to issue a book on religions that are officially recognized in Iraq and provide a definition of religious diversity. Millions of copies of the book are to be distributed. In response to the message from the self-styled Sunni grand mufti of Iraq, Sheikh Mahdi al-Sumaidaie, who called on Christians not to take part in Christmas celebrations, Sunni Sheikh Anas al-Issawi told Qadiriyya community members in Baghdad that such messages are not acceptable at all. Issawi said the Sunnis of Iraq do not actually have the position of mufti and called for caution when it comes to fatwas that are issued based on political agendas that do not reflect the positions of the Iraqi Sunni community toward Christian citizens. Women were represented at the convention by Nadia Fadel Mghames, the first Iraqi woman to become the director of Mandaean Endowment. Mghames said her participation in the convention reflects a desire to strengthen the status of women in religious dialogues and to add another level of diversity to high-level meetings, where women are usually excluded. She said these meetings are important to help end religious and social discrimination against minorities and women. Khoei also referred to the previous meeting between Sheikh Abdul Waha al-Samarrai from the Iraqi Jurisprudence Council of Senior Scholars, stressing that the fourth meeting is a continuation of the previous ones. He said these conventions have become an urgent necessity to confront any possible attempt at sedition in light of the political conflict in Iraq. The first high-level meeting of religious leaders was held at the Chaldean Catholic Church on March 1, 2018, while the second was hosted by Mundi Sabian in Baghdad on April 26 of the same year. These meetings are the most important at the religious level since the United States invaded Iraq in 2003.